Mazda has upgraded the heart of its lineup with "SKYACTIV" technology, but other models are still lacking. For the 2012 model year, engineers took the Mazda3 compact car and turned it from a loser to a leader in fuel economy. A new direct-injection engine and six-speed transmissions led the way, but the car also got a host of other improvements designed to boost gas mileage. The turnaround was remarkable. The Mazda3's EPA-estimated fuel economy soared by more than 22 percent in mixed driving -- from 27 miles per gallon to 33. Highway mileage jumped from 33 mpg to 40. Mazda dubbed the improvements "SKYACTIV" -- a comprehensive approach to fuel efficiency. After the Mazda3 got SKYACTIV in 2012, Mazda applied the same lessons to the new-for-2013 CX-5 and redesigned-for-2014 Mazda6 midsize sedan, and both also became among the most fuel-efficient vehicles in their respective classes. But it's the 2012 Mazda3 that's the most notable. Why? Because with a simple mid-life update, Mazda breathed entirely new life into that car. And Mazda has some other cars that need that major fuel-efficiency update. Now. Take the Mazda2, the brand's fun-to-drive but slow-selling subcompact five-door. It's got a four-speed automatic transmission in a class of six-speeds and CVTs, and it lacks the Mazda3's spiffy new engine tech. The result? Gas mileage that trails key competitors, particularly on the highway. Its 34-mpg highway rating is 6 mpg below the bigger, heavier, and more powerful Mazda3. With SKYACTIV, the Mazda2 could get fresh attention in a burgeoning class of subcompacts. Mazda is a small brand whose cars often make their best impression from behind the wheel rather than on a spec sheet -- the gas mileage victory would get people looking at the Mazda2, and make it more enticing for them to do more than just look. 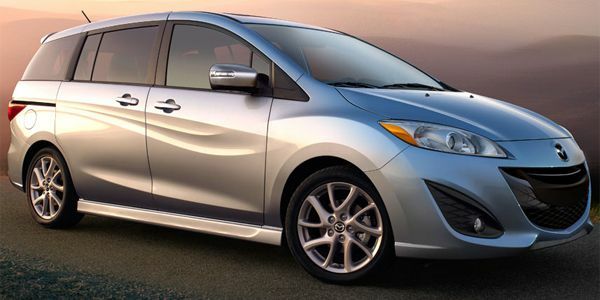 Another Mazda that would really benefit from SKYACTIV is the Mazda5, a mini-minivan based on the Mazda3. With three rows of seats in a compact, affordable package, the Mazda5 would be a brilliant niche vehicle for someone who wants to avoid a great big V6-powered fuel-swilling minivan. The problem: gas mileage just isn't all that great. A whopping two miles per gallon better than a hugely spacious and cushy Honda Odyssey -- 24 mpg in mixed driving. But when equipped with the same engine and transmission as the Mazda5, the 2013 Mazda3 2.5-liter -- without SKYACTIV -- earned almost identical EPA ratings. The 2014 Mazda3 2.5, with SKYACTIV, has jumped to 31 mpg in mixed driving. Imagine a useful family car with seating for six, a handy amount of cargo room, and convenient sliding doors -- that could get 30 miles per gallon. The Mazda5 is the only car in its niche in the U.S., but the niche remains small. Outstanding gas mileage would make the Mazda5 a far more compelling choice for the sensible small family. Actually due for improvements is the Mazda MX-5 Miata, the zippy little roadster that should be getting more than 24 miles per gallon in mixed driving -- especially considering that it drinks premium fuel. Details remain scarce on its upcoming complete redesign, but expect a huge jump in gas mileage that will add a further measure of affordability to this gem of an affordable roadster. The odd man out of the SKYACTIV fun will be Mazda's least fuel-efficient vehicle, the full-size CX-9 crossover. Developed in the days when Ford had an ownership stake, it uses Ford mechanicals that include a Ford 3.7-liter V6. The CX-9 doesn't share enough with other Mazdas to justify a large-scale investment in giving it the SKYACTIV treatment. Fortunately, the CX-9's fuel economy -- while hardly stellar -- is still class-competitive among huge V6 crossovers: 19 miles per gallon overall with front-wheel-drive. That will hold it over until Mazda replaces it with a people-hauler of its own devising. See other Mazda coverage from Torque News. Recent articles discuss a flurry of awards for the Mazda3 and Mazda6, and a Japanese-only Mazda3 hybrid. Much of this happened, I think, because of refresh cycles and the introduction strategy for SKYACTIV. The Mazda2, and 5 refreshed before or during the Mazda3's introduction which brought in SKYACTIV, so they got skipped as part of the overall brand strategy. The Mazda6 was next, becoming teh flagship for the whole, bumper-to-bumper SKYACTIV program. I suspect the others will follow. We own a Mazda5, though pre-refresh (ours is a 2006, refresh was 2013). We routinely get 30 mpg on the highway in it and I love the fact that it has no timing belt interval as it's the last of the i4's with a chain. It has issues now, mostly due to age and nearing the 100k mark in mileage, but nothing out of step with what would be expected of any vehicle. I would love to see the company improve these with SKYACTIV updates to upgrade the suspension, handling, and fuel economy. I'd buy another in a minute.